Every so often GMP (Greater Manchester Police) run something they call Operation Considerate, where they sit at the side of the road and catch up with Cyclists cycling on the pavement, or with out lights, and occasionally talk to car drivers for much more serious offences (Driving without Insurance etc). However one thing they seem to be unable to catch is people who’s cars have magically managed to end up on the pavement. After posting on Twitter, I was directed to the Operation Considerate Reporting site] and email address. Driver of EA64RKK drove onto the Pavement of Coronation street, to take a phone call using a hand held telecommunications device (iPhone) while engine was still running. Section 72 of the Highways Act 1835. 72 Penalty on persons committing nuisances by riding on footpaths. F2; every person so offending in any of the cases aforesaid shall for each and every such offence forfeit and pay any sum not exceeding [F3level 2 on the standard scale], over and above the damages occasioned thereby. Regulation 110 (1) and (2) prohibits a person from driving, or causing or permitting a person to drive, a motor vehicle on a road if the driver is using a held-hand mobile telephone or a hand-held device. Regulation 110 (3) prohibits a person from using a hand-held mobile telephone or hand-held device while supervising a holder of a provisional license ( learner driver) whilst the learner is driving. Regulation 110 (5) provides that the regulation is not breached where a person makes a call to the emergency services on 999 or 112 in response to a genuine emergency, where it is unsafe or impracticable for him (or the provisional licence holder) to cease driving whilst the call is made. It is an offence under section 41 D(b) of the Road Traffic Act 1988 to contravene Regulation 110. The penalty imposed will depend upon the type of vehicle driven. Under existing case law a person may still be driving whilst the engine is running and the vehicle is stationary. This matter has been forwarded to the Inspector whom deals with the area concerned. Could you please supply me with the crime reference number please? I have again forwarded the matter to the Inspector whom deals with that area, and asked him to contact you directly. In any case the offence is not a crime as such no crime number can be provided. If he does not please ask again. I thought Crime and Offence were interchangeable terms? I later found out that the ‘Op Considerate’ mail box is being managed by ‘PC X 03439 V. DAVIES’ who is the Chief Technology Officer of the Road Crime Unit at Hyde police station. Any way finally on the 11th of January I got the following email back from Stephen Gilbertson, C North & The Heatons Local Policing Team Inspector at Reddish Police Station, just down the road from where I took the photo. I am in the process of identifying/speaking with the police officer responsible. I will report back to you in due course. Your photograph shows the nearside wheels of the vehicle on the pavement. I am satisfied that there is sufficient room left on the pavement for a wheelchair or a large double buggy to pass without having to go into the road and does not commit the offence. Your photograph is not clear enough to show the driver on a mobile phone. However, PC Hallworth confirms that she was on the phone – even though the engine remained on, she states the vehicle was stopped, in neutral & hand brake on. I am satisfied that the officer does not commit the offence. Despite my conclusions, whilst speaking with the officer I have advised them that the way they have used the vehicle on this occasion is not of the standard that is expected and can appear un-professional to the public which obviously caused you to take the action you did. I accept that under the circumstances there was perhaps no need to park on the pavement judging by the size of the road and that if they need to use their mobile phone that they do so with the engine switched off as well as parked up as it is in the picture. The advice I have given the officer is exactly the same course of action/discretion I would expect from one of my officers with a member of the public in the same circumstances. As a result I can confirm that the matter has been locally resolved as no further action. Does this mean that Operation Considerate will not go after people who while on a push bike, do not feel comfortable playing dodgems by 1000 kg + lumps of metal? After all Stephen has stated that no offence occurred as a “wheelchair or a large double buggy [was able] to pass without having to go into the road”, And and V. Davies stated that no crime/offence had occurred when I asked for a reference number. I am sure a courteous cyclist would give space to a wheelchair user, or a parent with a large double buggy. Stephen stated that “The advice I have given the officer is exactly the same course of action/discretion I would expect from one of my officers with a member of the public in the same circumstances”. Agree and disagree. Shouldn’t be done but hardly blocking it. I’m sure the phone is only an issue if the engine is on? 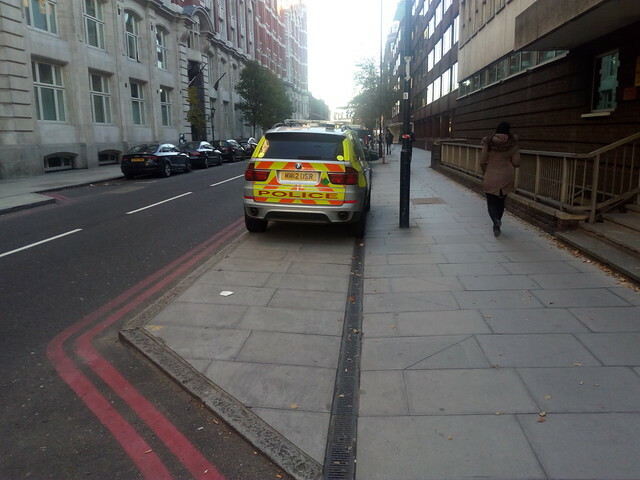 Often think this: police set such good example with their driving, need to do same for parking too. That’s is actually a pretty decent response. While I concur with both your points, I can also see the GMP side of things. But they MUST be aware of the visuals of the matter and it is good they replied. Now to see if this lenience is passed over to cyclists…. 12.—(1) An authorised person who has reasonable cause to believe that the driver of a vehicle that is stationary on a road is committing a stationary idling offence may, upon production of evidence of his authorisation, require him to stop the running of the engine of that vehicle. (2) A person who fails to comply with a requirement under paragraph (1) shall be guilty of an offence and be liable on summary conviction to a fine not exceeding level 3 on the standard scale. Previous post We have butterflies!